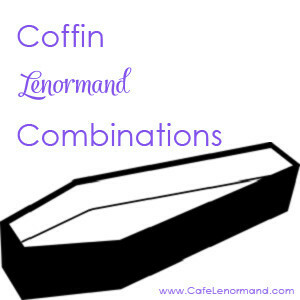 Whether you need help interpreting a spread or are completely stuck altogether, this list of Lenormand Coffin combinations can help you. If you come up with a combination that isn't on this list, it doesn't mean your combination is wrong. This is only a list of the most common combinations. As you learn Lenormand, you'll soon see that there is an infinite number of possible combinations, changing depending on the question asked, the querent, and more. Let me know what you think of these Lenormand Coffin Combinations in the comments below. I'd love to hear from you! Thanks for letting me know, Janice. I’m so glad my blog is helping you!